There are currently 114,865 users on this website. 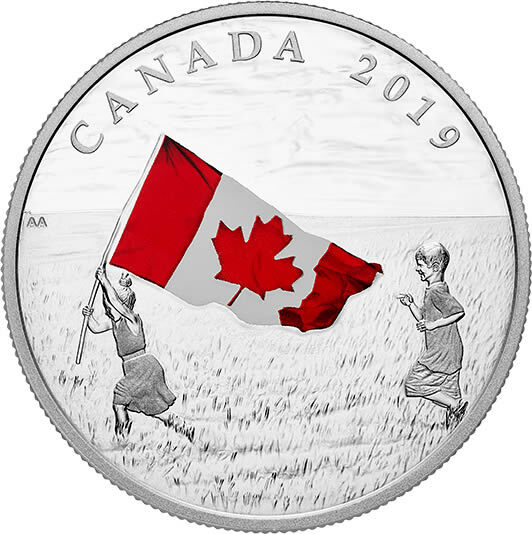 Royal Canadian Mint - Canadian photographer Aoifa Anctil captured this image of a young girl running through a field with the Canadian flag and her brother following close behind. The horizon in the distance and the great expanse of sky convey the vast landscapes that characterize Canada. Vibrant red and white give the flag movement and highlight its design. The effigy of Her Majesty Queen Elizabeth II by Susanna Blunt with "20 DOLLARS" and "ELIZABETH II D.G. REGINA" engraved along the outer edge of the coin is on the obverse.